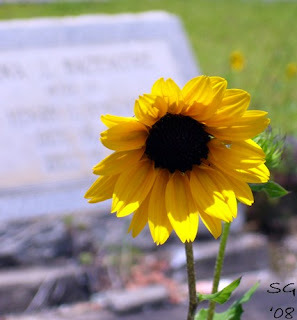 I think it is rare to find sunflowers on a grave...I usually see roses or some other kind of flowering bush, like yellow bells. Birds kindly "plant" sunflowers. We built a rock wall around an area in our yard to plant flowers and much to our amazement one year, the birds created a beautiful sunflower garden! 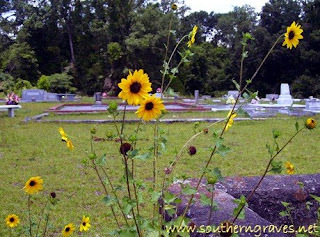 The area with the rock wall was full of sunflowers. 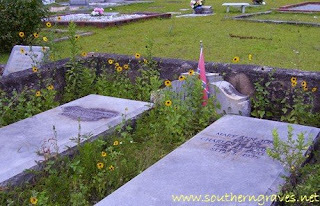 I believe the sunflowers on the graves are simply the result of birds doing what birds do. Myself, personally, I believe sunflowers are a symbol of cheer and happiness. Perhaps they are saying, "Do not weep for me, be of good cheer."